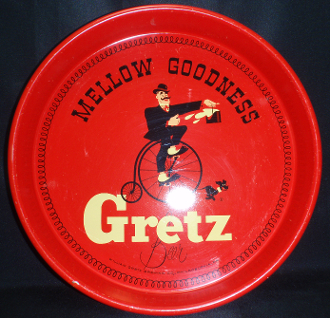 Gretz Mellow Goodness Beer Tray with a 13" diameter and 1 3/4" dept. Nice graphic with glossy finish. Tray does have a few scratches and dents. Nice tray for display. Back side has label and top residue, all of which could be cleaned. Bottom front marked William Gretz Brewing Co., Philadelphia, PA.